Zone in and make your workout more efficient and effective! This high-intensity TRX Circuits series targets heart rate zones to maximize results and fun. Using the Myzone technology, participants are able to accurately track effort in real time and make immediate adjustments to challenge the body and hit those goals sooner! 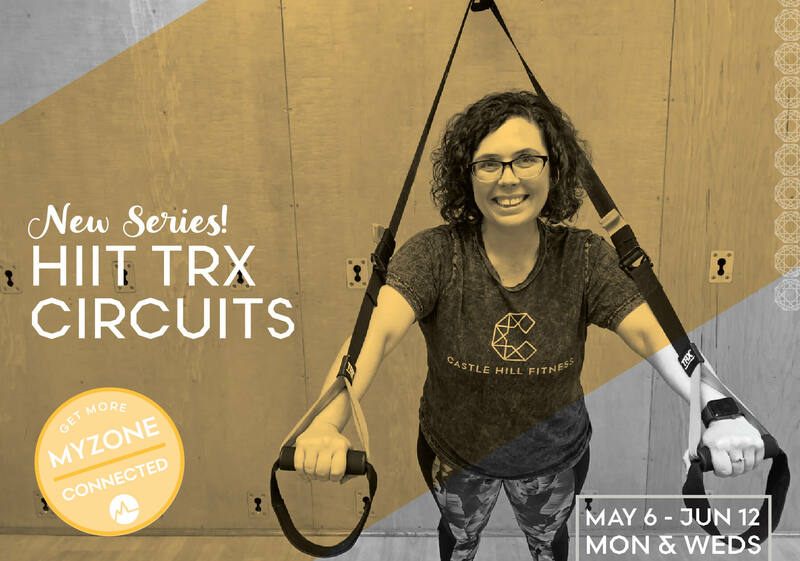 Each class will complete a different circuit, utilizing med balls, jump ropes, and the rip trainer in addition to the TRX suspension trainer. Sign up for this series and SAVE 30% on the Myzone wearable technology! All levels welcome. No current injuries. Following series registration, payment for the discounted Myzone Heart Rate Tracker will be processed separately. Contact deb.peterson@castlehillfitness.com with questions. Tara has an extensive background in the health and fitness industry, with over sixteen years working as a personal trainer. She earned her Masters Degree in Kinesiology from UT in 2004, and since then has acquired certifications from various organizations including ACE (Certified Health Coach), Precision Nutrition, Functional Movement Systems, and Primal7. Tara believes in a habit based, holistic approach to health and wellness. She has successfully helped many clients meet their goals to lose weight, improve their health, look great in their clothes, and age gracefully. Above all, she is passionate about helping her clients find the joy and satisfaction that comes along with accomplishing more than they thought they could.